Our conservation research program for giant pandas is aimed at designing effective management strategies to ensure the survival of this iconic species. We are the only team monitoring giant pandas in the wild using GPS satellite telemetry and remote camera traps. At Foping Nature Reserve, our Recovery Ecology field crew is studying mating behavior, dispersal, denning ecology, health status, and the effects of human disturbance. In areas where old-growth trees have been logged, the remaining trees are too small to serve as suitable birthing dens for pandas. We are studying how this limits population size and how we can address it. We are working with our partners to help recover wild populations and remove obstacles to panda reproduction. Research at the Wolong Breeding Center on the timing of ovulation, artificial insemination, early pregnancy detection, birth, maternal care, and cub development is applied to monitoring panda reproductive cycles and improving management following conception. 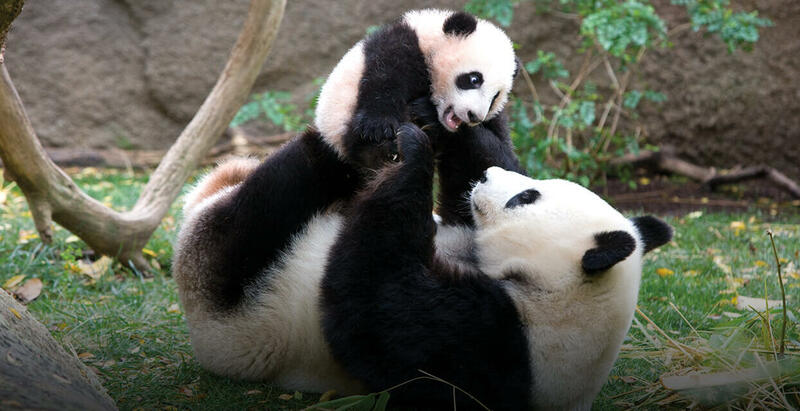 The multidisciplinary scientific approach spearheaded by our Reproductive Sciences team has led to the birth and survival of six cubs at the San Diego Zoo and a dramatic turnaround in the breeding program at the Wolong Breeding Center, where panda numbers have increased from 25 to over 130 in 10 years. For the first time, the possibility of reintroducing pandas into the wild is being discussed. Dr. Ya-ping Zhang undertook the first population genetic studies of giant pandas in our Conservation Genetics lab. This groundbreaking study led to a complete analysis of the giant panda studbook population and identification of paternity for many cubs. Later, we collaborated with Chinese colleagues on the first giant panda genome assembly using next-generation sequencing technology. Our work at the Zoo includes experiments to study the role of olfactory communication, and detailed observations of reproduction and male-female interactions. Our Recovery Ecology team is collaborating with San Diego Zoo keepers to determine the hearing range and sensitivity of pandas to understand and mediate noise disturbance for zoo pandas and those living in the wild adjacent to expanding human activities. We have provided training and capacity building for more than 40 Chinese biologists and animal care specialists, zoo personnel around the world, and dozens of students and volunteers. Our Disease Investigations team is currently hosting a series of workshops in China aimed at improving giant panda health and disease management.